I know it’s probably normal to make the same dishes year after year for Thanksgiving, but I always try to bring something new. I think it’s fun to make new dishes, because it can get a little boring around the holiday table. This year I’m going totally different but totally delicious (and healthier!). These cauliflower kale-stuffed mushrooms are a vegetarian’s and gluten-free lover’s dream come true. The cauliflower mixture is a little more pestolike in texture but still makes a nice, meaty filling. I added a lot of garlic because I love garlic, but feel free to throw in any flavors you prefer. 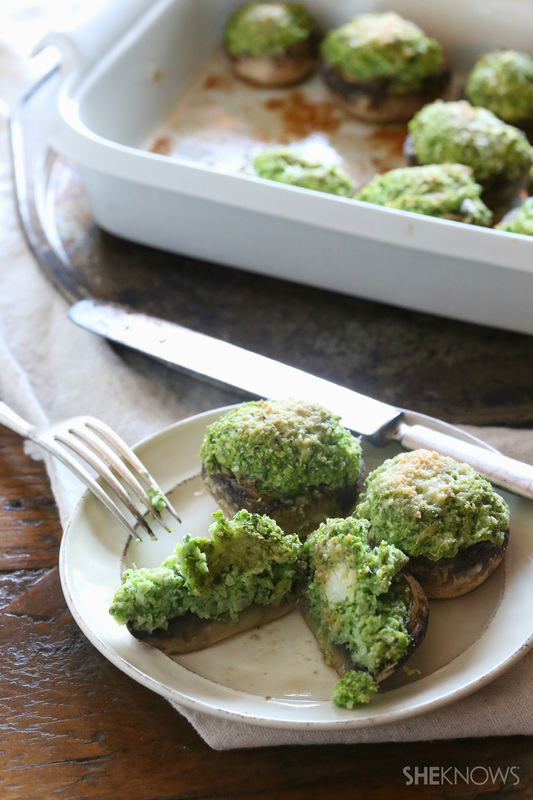 These are so beautiful and a fun twist on classic stuffed mushrooms. These stuffed mushrooms are packed full of a delicious cauliflower, baby spinach and kale stuffing. They’re healthy, flavorful and perfect for your holiday table. Preheat the oven to 400 degrees F, and set the mushrooms aside. To the bowl of a food processor, add the cauliflower florets, baby spinach, baby kale, egg, olive oil, garlic, salt and pepper. Process until the cauliflower is the texture of couscous. The mixture should be moist and hold together when scooped. Place the cauliflower into a strainer, and strain over the sink for 15 minutes. This helps drain out the extra moisture from the mixture. Fill the mushroom caps with the cauliflower mixture, and place the caps into an 8 x 8-inch pan. 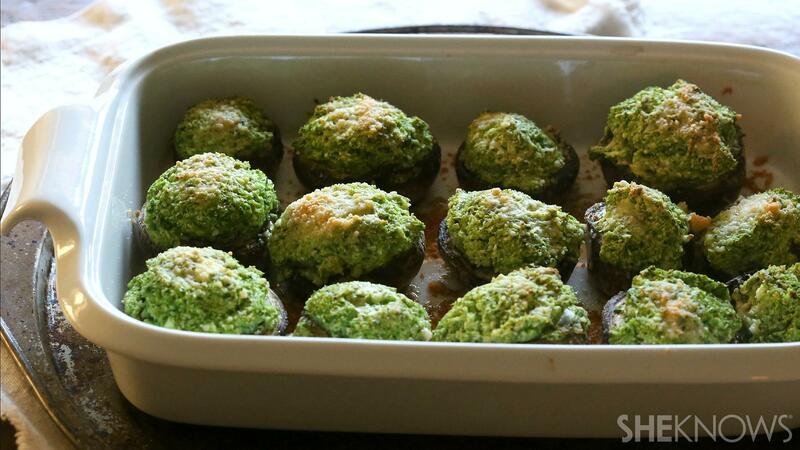 Sprinkle with Parmesan cheese, and bake for 25 minutes, until the mushrooms are soft and the filling is hot.